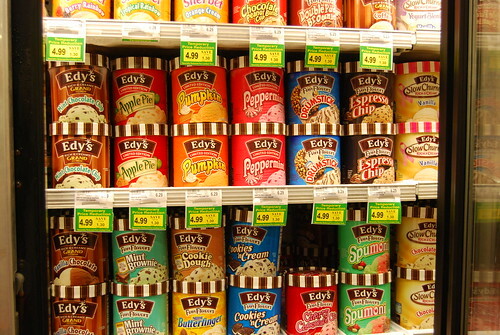 We just returned from a week-long trip from the East Coast where Dreyers’ ice cream goes by the brand Edy’s. Also, Carl’s Jr. is known as Hardee’s. And we woke up whenever we wanted and ate donuts every day. Look for posts on our trip soon! Hardee’s is the same as Carl’s Jr.? It’s been many years since I lived in Hardee’s land. I just remember it was one fast food place you could get a hot dog when I was a kid. [Ew]. I actually didn’t know that until recently too. I only knew about Hardee’s when living in N. Chicago as a kid. i love that you took a photo of the ice creams in the store! i was the same way when i was in the beer/chips section at the wal-mart in wisconsin! I love checking out regional grocery stores to check out different products. This same store also had a Jamaican patty aisle! I am glad you are home!